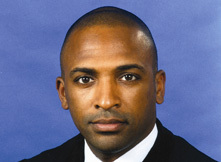 Today the U.S. Senate confirmed Darrin Gayles as a judge for the Southern District of Florida, the first time an openly gay African American will serve on the federal bench. One of SAVE’s missions is to place pro-equality leaders in all levels and branches of government. You might remember that SAVE had been pushing for a confirmation vote after a failure by Florida's Senator Marco Rubio to file procedural paperwork stopped the nomination of William Thomas, another gay African-American judge. Judge Gayles’ confirmation is a huge step forward not only for our mission in South Florida but also for our nation as a whole. I commend the President for his selection of such a qualified jurist like Judge Gayles, and I also commend the U.S. Senate for ratifying his nomination.